I am so proud of myself! This was my very first attempt at making any kind of soup other than chicken veggie soup without a recipe to follow as a guideline. And… drum roll please… it turned out great! Tonight I made homemade butternut squash soup. Not only was it so easy, but it was delicious, too! I wanted to use the mashed butternut squash I baked last week because I was afraid it would go bad if it sat in my fridge too much longer so I figured tonight was a good night to attempt butternut squash soup! 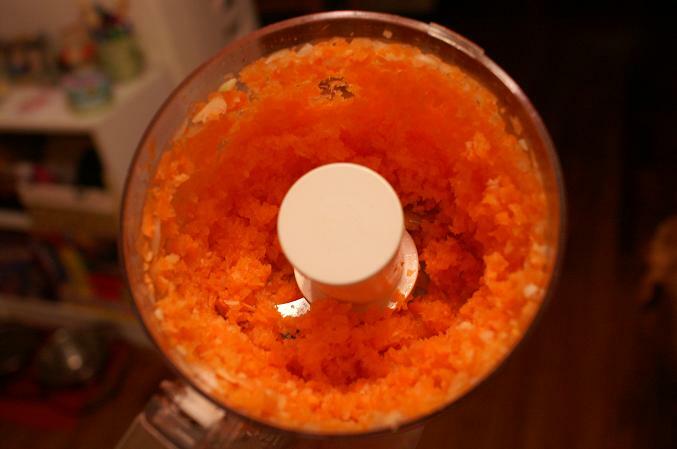 I started by dumping half of a bag of baby carrots and half of an onion into the food processor. I processed the veggies until they were almost smooth. 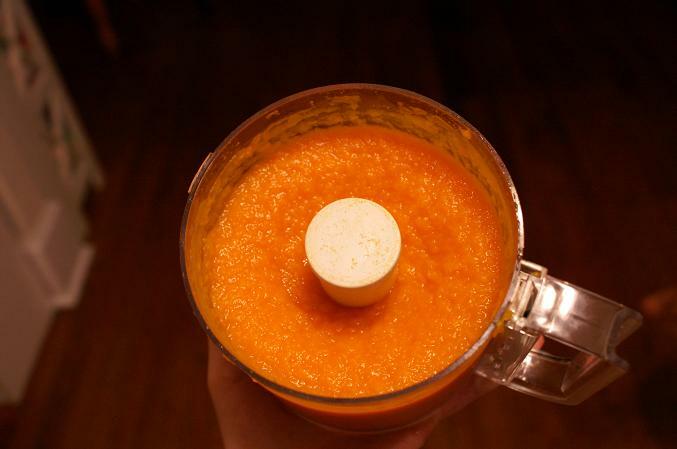 I then put the butternut squash flesh in the food processor to blend it until it was free of any lumps. 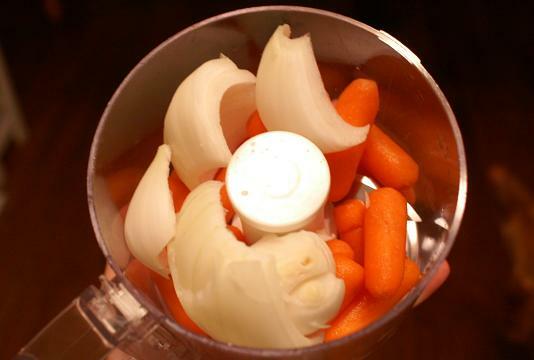 I sprayed a pot with cooking spray before dumping the carrot and onion mixture into the pot and letting it sizzle for 3 – 5 minutes. 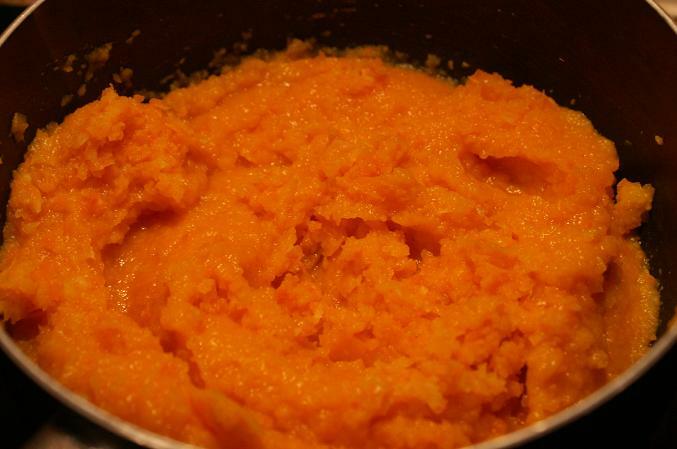 I then added the butternut squash and stirred the mix regularly for about 3 minutes. After adding 2.5 cups of chicken broth, the mixture became more soupy. I let it simmer on low for about 10 minutes so all the flavors would come out to enhance the soup. When it was done and Ryan and I both enjoyed every last slurp of this soup! 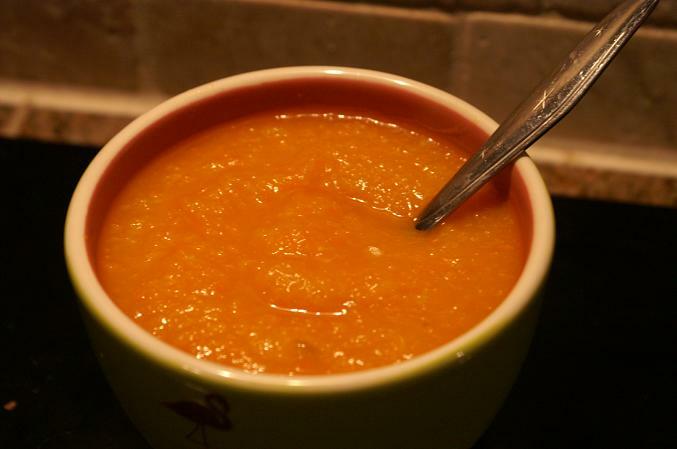 Hooray for a successful first attempt at butternut squash soup! Enjoy your movie night, Julie! you could absolutely substitute vegetable broth for the chicken broth & it would be 100% vegetarian! hope this helps! The sweet potato suggestion from Vee sounds good too. EASY and delicious! RIGHT UP MY ALLEY! ooooh that looks so good! 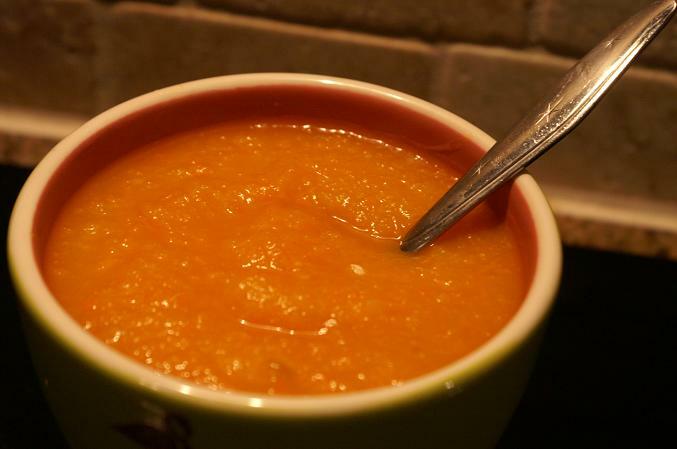 I’ve never made a squash soup before – this looks awesome and perfect for the season! I love butternut soup! I sometimes mix it with sweet potato and pearl barley (for that crunch). Did you add any spices to it (garlic, corriander etc)? Looks delicious! A great soup. My kind of soup.